Our high school co-curricular program provides opportunities for students to develop friendships, explore their interests, become leaders and extend their thinking beyond the classroom. With over 60 clubs, there are a myriad of opportunities for community building as students work towards common goals. All students are encouraged to take full advantage of co-curricular opportunities and ownership of their growth in the community outside of the classroom. If a student’s passions and experiences are not represented by the co-curriculars currently offered, he can propose a new group. This type of student initiative, leadership and service is encouraged and celebrated. 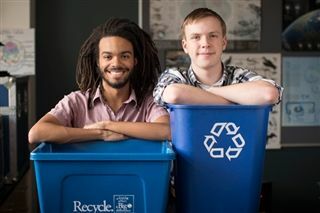 The mission of the Green Eagles team is to raise awareness for environmental issues and to empower fellow students, teachers and the BC High community in green initiatives, such as waste reduction, recycling, composting, energy conservation and pollution prevention. For more information about our High School Co-Curricular program, please contact Amanda Adamczyk at adamczyk@bchigh.edu, or Tonya Winter at winter@bchigh.edu.